for news content, so we've decided to provide a preview of error reports in Search Console to help you get ready for the upcoming official AMP launch and get early feedback from you. You can find these reports under Search Appearance - Accelerated Mobile Pages. The goal here is to make it easier to spot issues in your AMP implementation across the whole website. In order to get started with AMP on Google Search, you'll need to create matching, valid AMP pages where relevant, ensure that they use the NewsArticle schema.org markup, and link them appropriately. 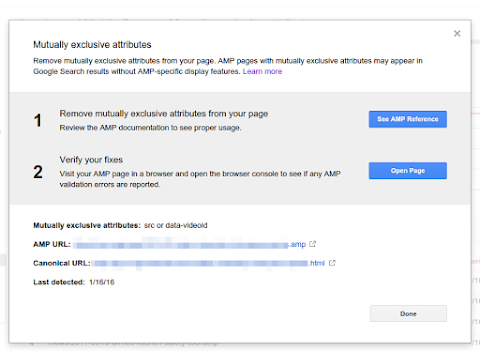 The AMP error report gives an overview of the overall situation on your site, and then lets you drill down to specific error types and URLs. This process helps you quickly find the most common issues, so that you can systematically address them in your site's AMP implementation (potentially just requiring tweaks in the templates or plugin used for these pages). Curious about AMP and how it might fit in with your site? Here's a demo preview of AMP in search, more on how AMP works, and a guide to getting started with AMP. If you think AMP would be a good fit for your website, implementing it might ultimately be as easy as installing a plugin in your CMS, so check with your provider. AMP hasn't officially launched in Google Search, so there's still time to get set up -- feedback & patience will be appreciated by your CMS & plugin providers. Stay tuned for more updates on the AMP Project blog. We're only getting started -- this is a first step at AMP error reporting. We'll be refining this report in the near future, and we'd love to get your feedback to help us. Let us know in the comments here how things work out for you. More and more sites are implementing Accelerated Mobile Pages (AMP) for news content, so we've decided to provide a preview of error reports in Search Console to help you get ready for the upcoming official AMP launch and get early feedback from you. You can find these reports under Search Appearance - Accelerated Mobile Pages. The goal here is to make it easier to spot issues in your AMP implementation across the whole website. In order to get started with AMP on Google Search, you'll need to create matching, valid AMP pages where relevant, ensure that they use the NewsArticle schema.org markup, and link them appropriately.